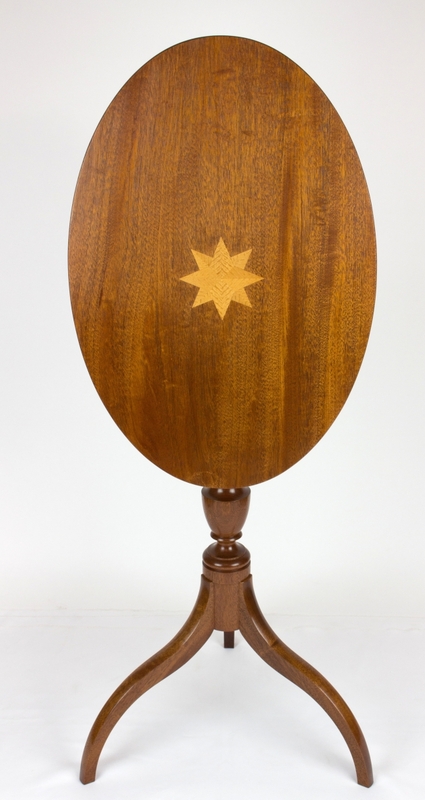 Ronald Trapasso (NBSS ‘69) was struck by the beauty of the Alcott family drop leaf table shown right, and wanted to create a piece that paid homage to the table’s specific provenance. 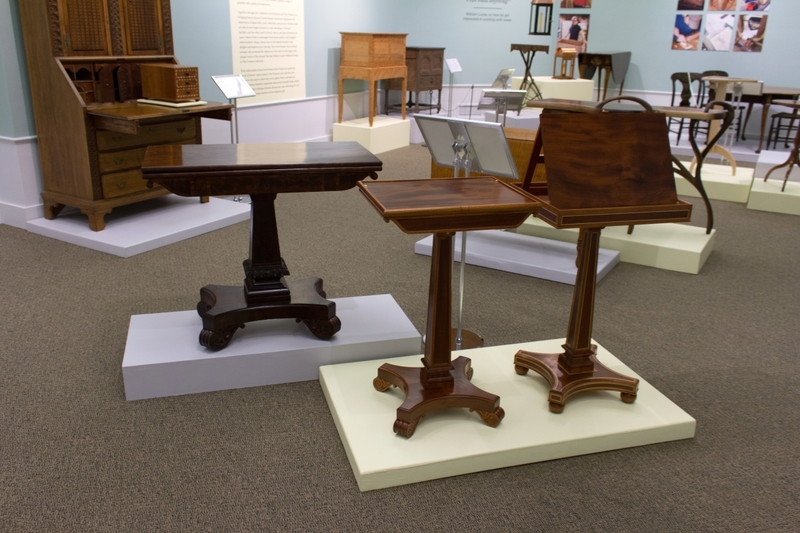 His table is shown on the left. BOSTON and HARVARD, MASS. 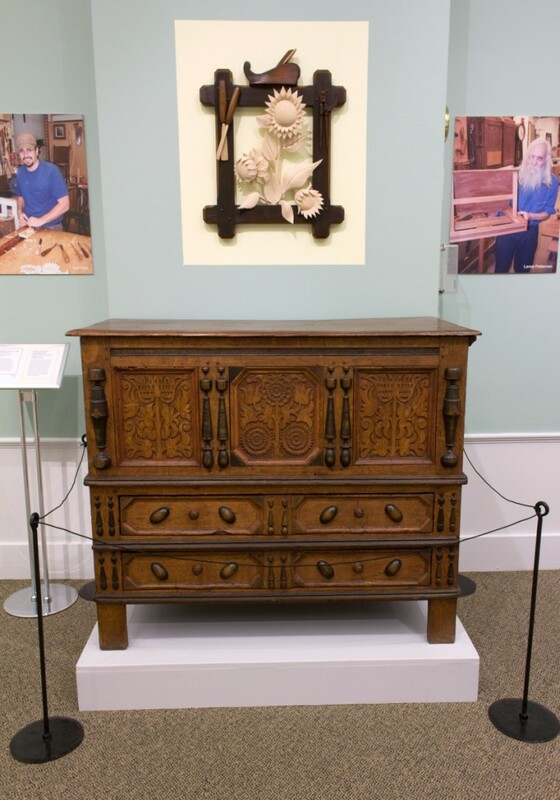 – Fruitlands Museum in Harvard is presenting a collaborative exhibition of handcrafted works made by 13 master craftspeople from North Bennet Street School that are shown alongside historic works that served as inspiration for the craftspeople who made them. 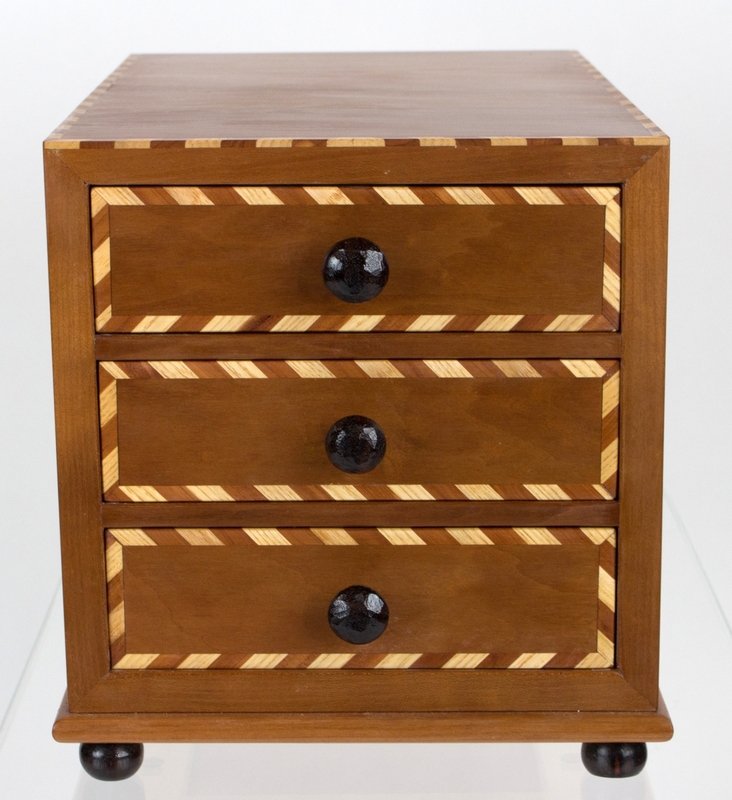 All the historic works are pieces of furniture hand selected from historic houses operated by the Trustees of Reservations. 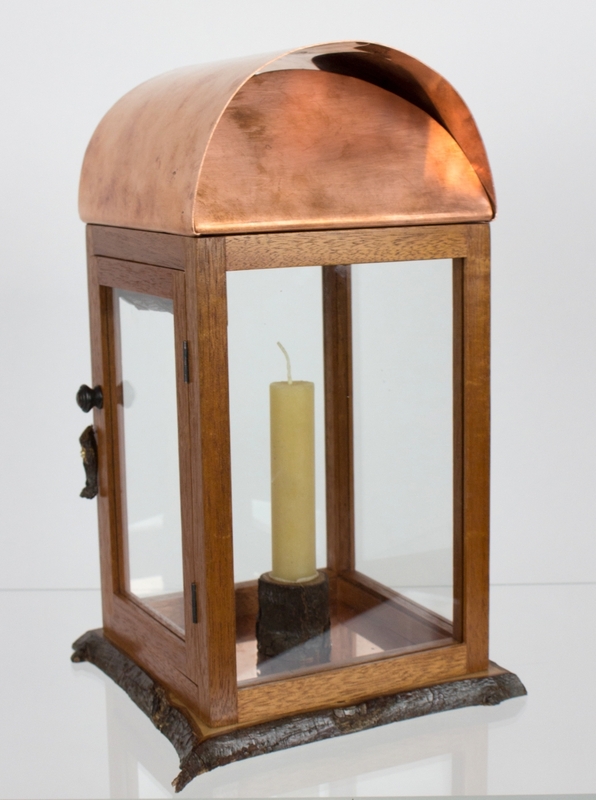 The twig table shown left was the inspiration for Ellen Kaspern’s copper and twig lantern, right. 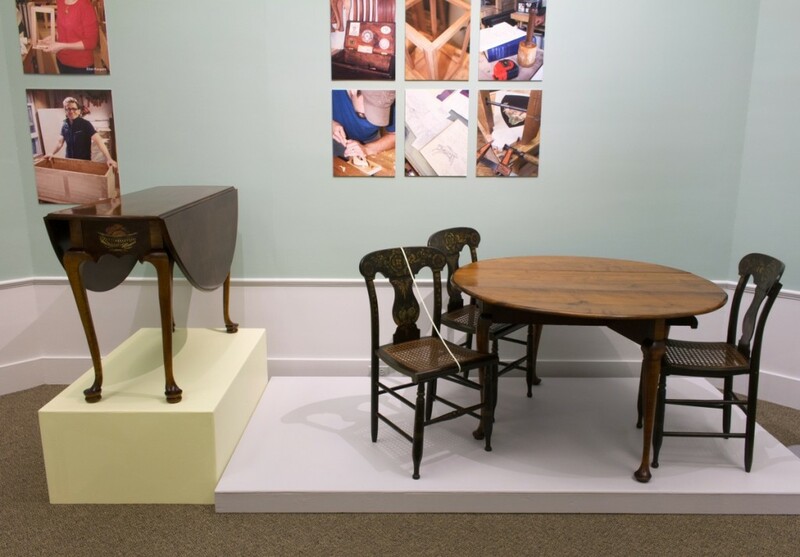 The exhibition, on view through March 25, provides an opportunity for the Trustees of Reservations to highlight furniture from its permanent collection while simultaneously demonstrating what historic works and craft traditions mean to graduates and instructors from Boston’s acclaimed North Bennet Street School. 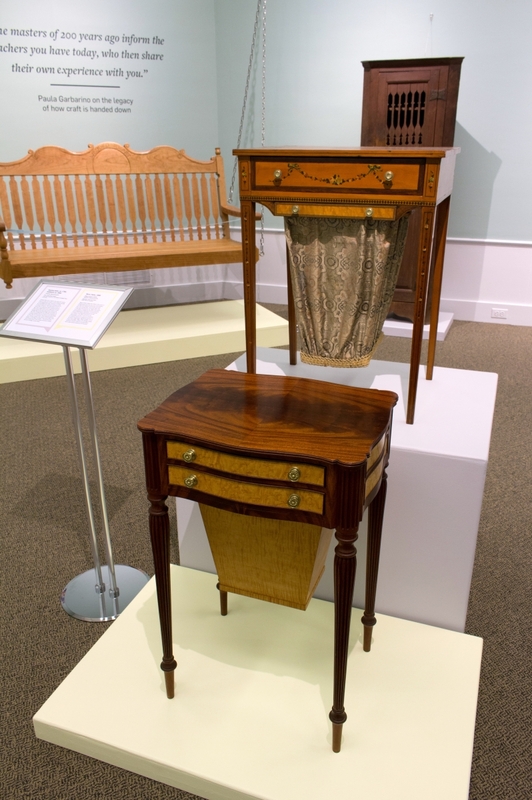 While some of the North Bennet Street School craftspeople recreated historical pieces in modern ways, other craftspeople demonstrated their inspiration in different ways. 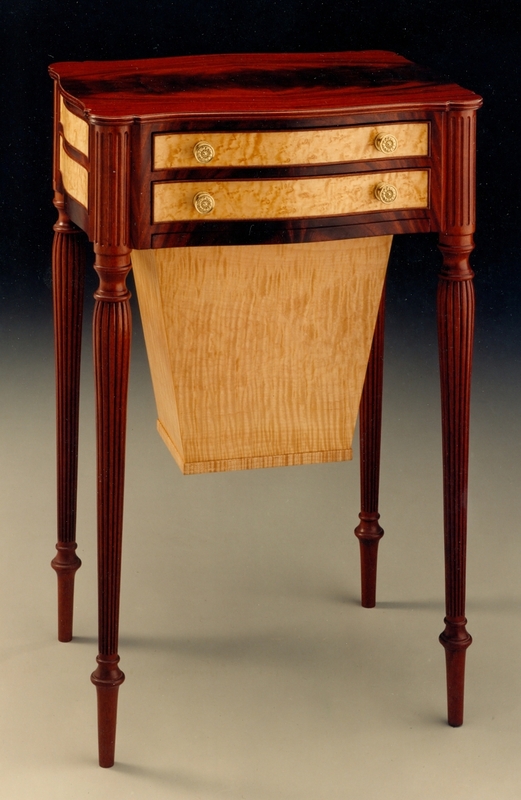 Some, like Dan Faia, showcased individual decorative elements of a piece when he was inspired by the sunflowers of a Seventeenth Century Connecticut sunflower chest to create a three-dimensional sunflower still life. 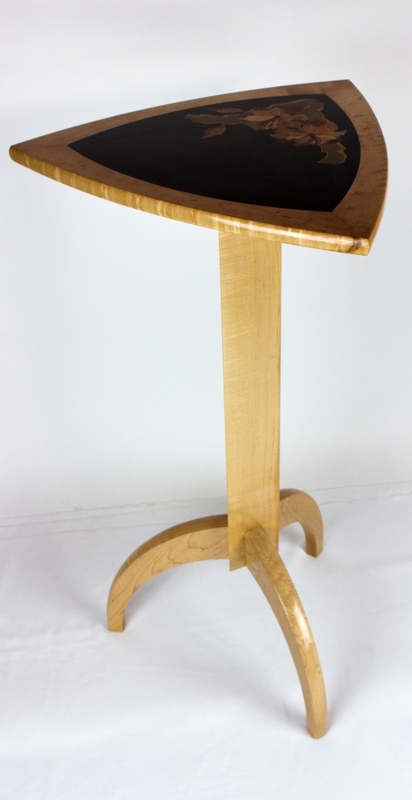 Paula Garabino modernized a common form, the tilt top table, by creating one with modern lines and dynamic inlay and veneers. 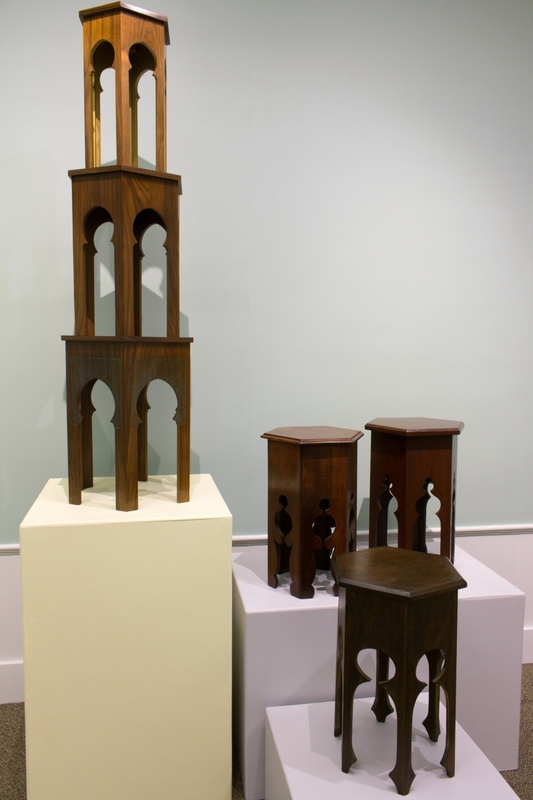 Robert Miller was inspired by a group of Moorish nesting tables that spoke of their original owners’ love of travel. Others made new forms inspired by old pieces. 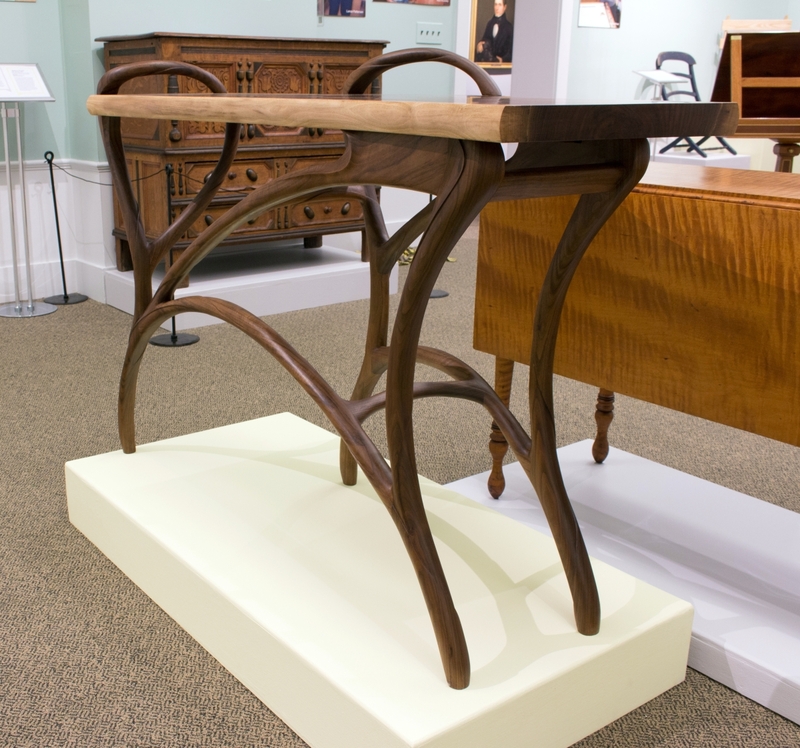 Lance Patterson combined the elegant lines of a historic form with his personal love of music to make hinged-top music stands that pay tribute to a Grecian card table. 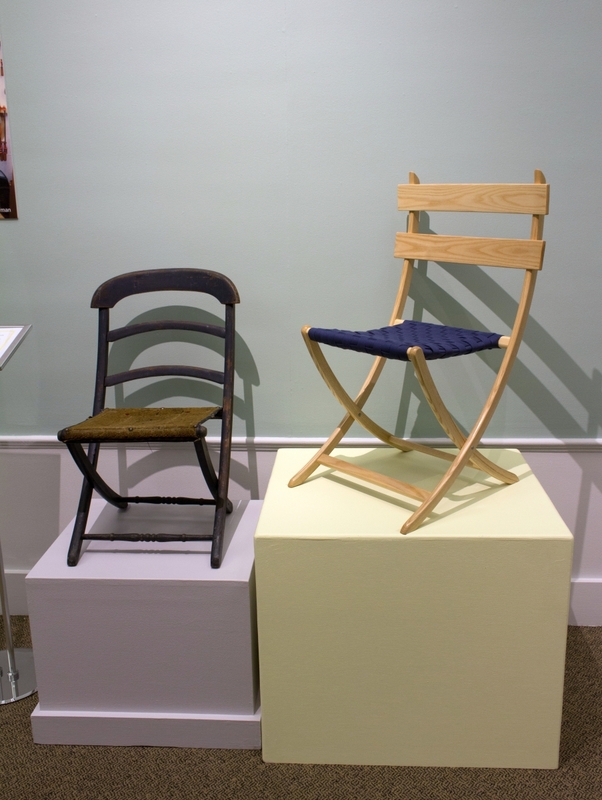 Matt Huffman adapted a mass-produced folding chair with the minimalist aesthetic of Shaker furniture to create a stylish chair suitable for any contemporary environment. 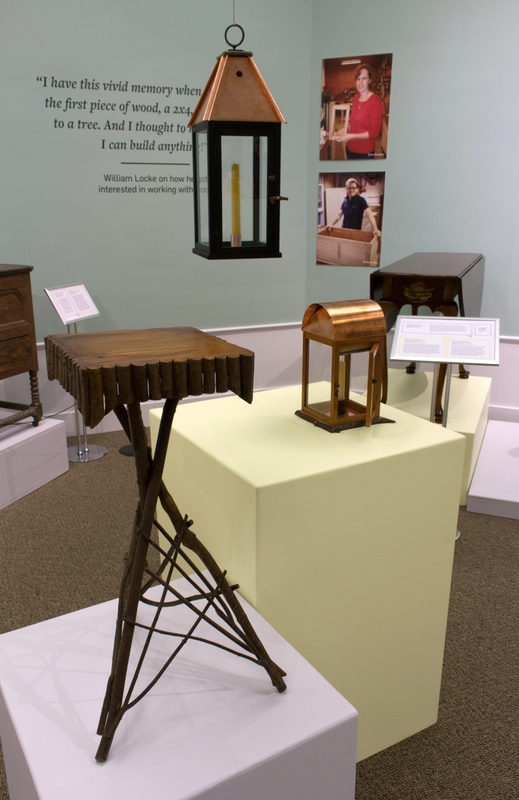 Ellen Kaspern imbued a symbol of the North Bennet Street School, a lantern, with pear branches, referencing both a cherished childhood memory and twig-form furniture made in New England in the early Twentieth Century. 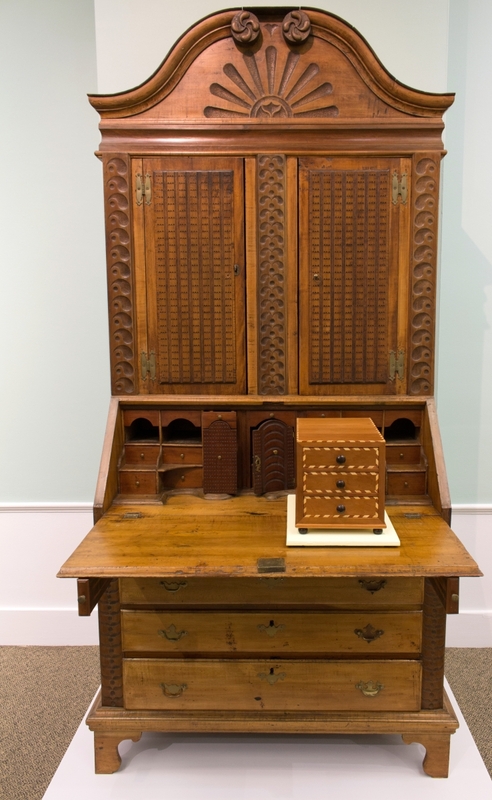 Shown here is the Connecticut Sunflower chest that provided the inspiration for Dan Faia’s three-dimensional sunflower still-life, shown here above. The walls of the exhibit are hung with photographs of the North Bennet Street School craftspeople taken while they were making the pieces. Gallery labels point out the inspirations that went into each piece and highlight similarities between the old and new pieces. 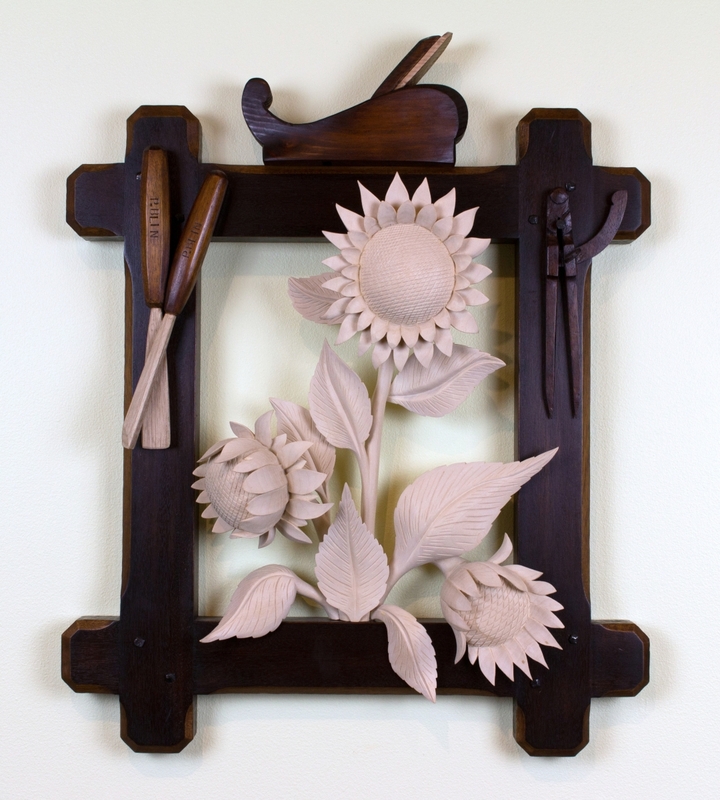 Many of the new pieces created for the exhibit will be available for sale by the makers. 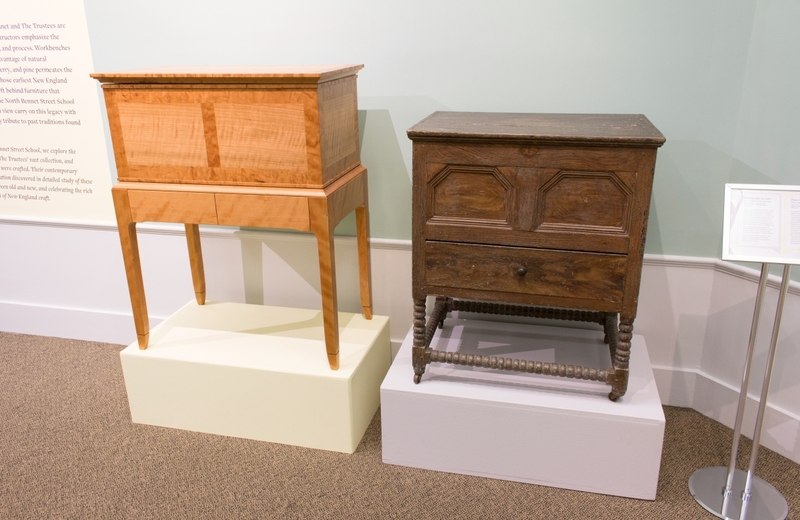 The exhibit will feature a variety of public events, talks and demonstrations at Fruitlands Museum throughout the winter and early spring. Fruitlands Museum was acquired by The Trustees in 2016, adding a significant cultural property to the organization’s network of cultural, natural and agricultural sites around the Commonwealth. The Trustees also host exhibitions, lectures, workshops and special events at the property year-round. www.fruitlands.thetrustees.org. Founded in 1891, the Trustees of Reservations is the nation’s first, and Massachusetts’ largest, preservation and conservation nonprofit organization. Its landscapes and landmarks continue to inspire discussion, innovation and action today as they did in the past. The 116 sites it oversees are destinations for residents, members and visitors alike, welcoming millions of guests annually. www.thetrustees.org. One of the nation’s oldest schools for hands-on training in traditional trades and fine craftsmanship, Boston’s North Bennet Street School is internationally known for its programs and for helping students to achieve meaningful lives and livelihoods. Fruitlands Museum at 102 Prospect Hill Road, Harvard. For additional information and a lineup of upcoming events, 978-456-3924 or www.fruitlands.thetrustees.org. 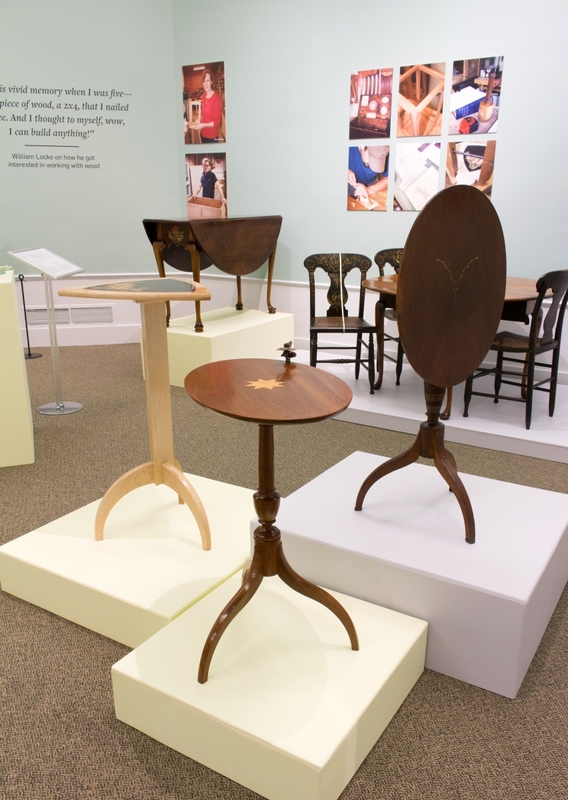 A tilt top stand from Southern Worcester and in the collection of Fruitlands, shown on the right, was the inspiration for Paula Garabino’s table, left, and Steven Brown’s table in the center.